This extremely comprehensive book covers a wide range of content from abbreviations and conversions, to substituting ingredients, cooking and baking basics, as well as helpful tips, meat cuts, how to cut up a whole chicken and how to fillet a fish, plus loads of terms and definitions, the food pyramid and table setting guidelines and so much more. It is also jam packed with over 165 recipes with each having space for you to make your own notes. Additionally, each chapter provides blank recipe pages for you to add your own favourites. All in all, this book is a great buy. The Complete Cook Book is one of the most comprehensive I have had the liberty of perusing. From the conversion tables, tips and tricks to the wonderful array of recipes shared from friends and family. Personally there are many happy memories of weekend meals shared with friends and family through recipes compiled in this book. One can easily imagine the love and total dedication to detail which Mandy has poured into the writing of this wonderful book. 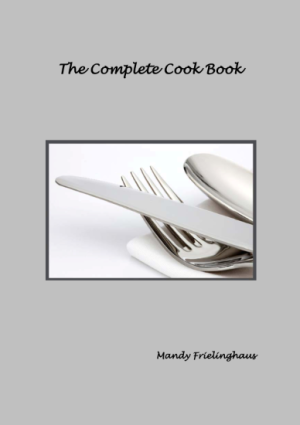 Having known Mandy for a number of years, I know this has been her dream for a long time and she has given us a fantastic array of delicious recipes together with loads of useful hints on how to be a good host or hostess. She points out meaning of ingredients, which are not normally in our culinary vocabulary, and this is a great help. I found it most enlightening. When you get our hands on this book you will want to rush home and start cooking! One word of warning though, don’t read this book if you are hungry – you won’t know where to start. Well done Mandy! You make us very proud. “Pleasure may be described by the puritanical instinct within us all, but it is surely the necessary enhancer that life needs.” (Sister Wendy Beckett – art critic). Mandy brings “pleasure” into our lives with her collection of recipes. She covered the world in one book and at the same time gave much needed information to the young cook as well as the gourmet chef. Mandy’s wonderful character oozes from the pages and organisation of this book. The new ‘must have’ home essential. Besides refreshing and delectable recipes, you will find a myriad of useful well thought of tips and references, a truly wonderful tool for even a gourmet in the kitchen. Discipline and dedication are indicative of this exceptional and well drafted book. I wish you all the success that your book deserves. Aptly named, this is indeed the complete cook book – no home should be without it. Whether you are a seasoned whizz looking for something different to whip up or a complete novice starting out, you’ll find just the thing to whet your appetite within these pages. Not only do you get treasured family recipes that have been tried and tested for generations, you get an extra serving of insightful tips, table setting guidelines and a glossary of terms that will have you impressing your guests with your knowledge of everything from Al dente to Zabaglione. This is the one Cook Book that will keep you coming back for more – bon appetite! It is a great honour to write a few words for a sweet Angel’s recipe book. It has been prepared for every family to appreciate their food around their tables. The care and attention given to every bit of detail says enough about her special gift of knowledge on cooking, sharing and writing in such a wonderful way that we become the “specialists” in cooking – all we have to do is to give it a try. This book is such a gift that it will bring not only food for pleasure but also food for the soul, as is said; when the body is happy, so is the soul. Wishing you all the success for this special book.